o ▪ Very regular and uniform flutter waves with a saw tooth or picket fence appearance. o ▪ The flutter waves are typically inverted in leads II, III, and aVF and upright in V1. o ▪ The ventricular rate is variable depending on the number of atrial impulses conducted through the atrioventricular (AV) node. o ▪ The QRS complexes are narrow unless there is preexistent bundle branch block or the atrial impulses are conducted aberrantly or through a bypass tract. · ▪ Atrial flutter is due to reentry within the atria. There are two types of atrial flutter based on electrocardiogram (ECG) presentation: typical and reverse typical. Figure 18.1: Atrial Flutter. (A) Twelve-lead ECG showing atrial flutter. The flutter waves are regular with saw tooth or picket fence appearance and are typically inverted in leads II, III, and aVF and upright in V1(arrows). (B) Lead II is magnified from the ECG in(A) to show the appearance of the flutter waves. There is 4:1 AV conduction, meaning that there are four flutter waves (arrows)for every QRS complex. The flutter waves are separated by five small blocks, which is equivalent to a rate of 300 beats per minute. ECG, electrocardiogram; AV, atrioventricular. o ▪ Typical atrial flutter: This is the most common ECG pattern occurring in 90% of all atrial flutter. In typical atrial flutter, the atrial impulse travels from top to bottom across the lateral wall of the right atrium and circles back from bottom to top across the atrial septum. The flutter waves are inverted in lead II and upright in V1 (Fig. 18.2A). o ▪ Reverse typical atrial flutter: This type is uncommon occurring only in 10% of cases. The atrial impulse travels down the atrial septum and up the lateral wall of the right atrium, which is the reverse of typical atrial flutter. This will cause the flutter waves to become upright in lead II and inverted in V1 (Fig. 18.2B). · ▪ Atrial rate: The diagnosis of atrial flutter is based on the atrial rate, which is regular with a sawtooth configuration and is typically 300 ± 50 beats per minute (bpm). The atrial rate is the most important in differentiating atrial flutter from the other supraventricular arrhythmias. Figure 18.2: Diagrammatic representation of Atrial Flutter. (A) Classical atrial flutter with typically inverted flutter waves in lead II. The impulse travels down the lateral wall of the right atrium and up the atrial septum (arrow) in a counter-clockwise direction. The reverse type travels through the same pathway, (B) down the atrial septum (arrow) and up the right atrial wall in a clockwise direction, which is the opposite of classical atrial flutter. This causes the flutter waves to be upright in lead II. o ▪ The atrial rate is calculated by counting the number of small boxes between two flutter waves and dividing this number from 1,500 (see Chapter 5, Heart Rate and Voltage). o ▪ The atrial rate in atrial flutter may be <250 bpm if the patient is taking antiarrhythmic agents that can slow atrial conduction such as quinidine, sotalol, or amiodarone. o ▪ The baseline between flutter waves is usually wavy and undulating. · ▪ Ventricular rate: Atrial flutter is easy to recognize when the ventricular rate is slow as when there is 4:1 AV conduction, as shown in Figure 18.1. However, when the ventricular rate is rapid as when there is 2:1 AV conduction (Fig. 18.3A,B), especially when the QRS complexes are wide due to bundle branch block (Fig. 18.3C), the flutter waves may be obscured by the QRS complexes and ST and T waves making atrial flutter difficult or even impossible to recognize. · ▪ The ventricular rate in atrial flutter depends on the number of atrial impulses that are conducted through the AV node, thus the ventricular rate can be very rapid or very slow. · ▪ Atrial flutter with 1:1 AV conduction: Atrial flutter with 1:1 AV conduction is rare but is possible (Fig. 18.4). When atrial flutter with 1:1 AV conduction occurs, every atrial impulse is followed by a QRS complex; therefore, the atrial rate and ventricular rate are the same and is 300 ± 50 bpm (250 to 350 bpm). · ▪ Atrial flutter with 2:1 AV conduction: Atrial flutter with 2:1 AV conduction (or 2:1 AV block) is the most common presentation of atrial flutter in the acute setting. It is also the most difficult to recognize and is the most commonly overlooked tachycardia with a narrow QRS complex. Approximately 10% of tachycardia thought to be SVT is due to atrial flutter. Atrial flutter should always be distinguished from SVT because the acute treatment of atrial flutter is different from that of SVT. · ▪ When atrial flutter with 2:1 AV block occurs, every other atrial impulse is followed by a QRS complex, alternating with every other impulse that is not conducted. The ventricular rate is half the atrial rate. Because the atrial rate is typically 300 bpm, the ventricular rate in atrial flutter with 2:1 conduction is approximately 150 bpm (Fig. 18.5). · ▪ Atrial flutter with 2:1 AV block: When there is a regular tachycardia with narrow QRS complexes and the ventricular rate is 150 bpm, especially when inverted “P” waves are present in lead II, atrial flutter with 2:1 AV block should be the first arrhythmia to consider. · ▪ The following examples show some of the difficulties in recognizing atrial flutter when 2:1 AV block is present (Figs. 18.6,18.7,18.8). Figure 18.3: Atrial Flutter. (A) The diagnosis of atrial flutter is based on the presence of flutter waves with typical saw tooth appearance with a rate of 300 ± 50 beats per minute. The atrial rate is calculated by measuring the distance between two flutter waves and dividing the number of small blocks from 1500 as shown in (A). When the ventricular rate is rapid because of 2:1 atrioventricular conduction (marked by the brackets in A and B), especially when the QRS complexes are wide because of bundle branch block as shown in (C),the diagnosis of atrial flutter is difficult and may not be possible unless there is slowing of the ventricular rate so that the flutter waves can be recognized (arrows). · ▪ Differentiating atrial flutter from supraventricular tachycardia (SVT): When the diagnosis of atrial flutter is uncertain, vagal maneuvers such as carotid sinus pressure, is useful in differentiating atrial flutter from other types of regular narrow complex SVT as shown (Fig. 18.9). o ▪ Atrial flutter: In atrial flutter, carotid sinus pressure or AV nodal blockers such as adenosine or verapamil will slow AV nodal conduction resulting in a slower ventricular rate but will not convert atrial flutter to normal sinus rhythm (Figs. 18.9 and 18.10). o ▪ Regular narrow complex SVT: When the narrow complex tachycardia is due to SVT, the tachycardia may convert to normal sinus rhythm with carotid stimulation. SVT from reentry but not atrial flutter (Fig. 18.10) is frequently terminated by AV nodal blockers to normal sinus rhythm (see Chapter 16, Supraventricular Tachycardia due to Reentry). · ▪ Atrial flutter versus atrial tachycardia: Atrial flutter with 2:1 AV block may be mistaken for atrial tachycardia with 2:1 AV block. Atrial tachycardia with 2:1 AV block is usually from digitalis toxicity, whereas atrial flutter with 2:1 AV block is unrelated to digitalis and the patient may in fact require digitalis or other AV nodal blocking agents to slow down the ventricular rate. o ▪ Atrial rate: The atrial rate is the most important feature in distinguishing atrial flutter from atrial tachycardia (Figs. 18.11,18.12,18.13,18.14). In atrial flutter with 2:1 AV block, the atrial rate is approximately 300 ± 50 bpm with the lowest rate at 240 to 250 bpm. In atrial tachycardia with 2:1 AV block, the atrial rate is approximately 200 ± 50 bpm (150 to 250 bpm) (Fig. 18.11). o ▪ Morphology of the P wave: When the atrial rate of atrial flutter and atrial tachycardia overlaps, the two arrhythmias may be differentiated by the morphology of the P wave. In atrial flutter, the flutter waves are typically inverted in leads II, III, and aVF and the baseline between the QRS complexes is wavy and undulating (Fig. 18.12). In atrial tachycardia with AV block, the P waves are typically upright in leads II, III, and aVF and the baseline between the P waves is isoelectric or flat (Fig. 18.11). · ▪ Atrial flutter with variable block: As shown in Figures 18.15,18.16,18.17, atrial flutter is easy to recognize when the ventricular rate is slow as when AV conduction is 3:1 or higher. In atrial flutter with variable AV block, the number of flutter waves for every QRS complex varies from beat to beat (Fig. 18.17). · ▪ Atrial flutter with complete AV block: The diagnosis of complete AV block during atrial flutter should be considered when the ventricular rate is regular and is in the low 40s, as shown in Figure 18.18. When complete AV block occurs, the R-R intervals become regular because of the presence of a ventricular escape rhythm, independent of the atrial rhythm. Figure 18.4: Atrial Flutter with 1:1 Atrioventricular (AV) Conduction. (A-C) From the same patient. (A, B) Atrial flutter with 1:1 AV conduction. (C) The same patient during 2:1 AV conduction. Arrows point to the flutter waves, which are typically inverted in lead II with a rate ≥250 beats per minute. · ▪ Atrial flutter can be confused with other conditions other than SVT. Although the diagnosis of atrial flutter is straightforward when the ventricular rate is slow, the presence of motion artifacts, especially in patients with tremors such as those with Parkinson disease or patients receiving intravenous infusion from a volumetric infusion pump, can be mistaken for flutter waves (Figs. 18.19,18.20,18.21,18.22). · Atrial rate of 300 ± 50 bpm with a minimum atrial rate of 240 to 250 bpm. · Very regular and uniform flutter waves with a saw tooth or picket fence appearance. · Flutter waves are typically inverted in leads II, III, and aVF and upright in V1 in 90% of cases, although this may be reversed in 10% of cases, ‘becoming upright in leads II, III, and aVF and inverted in V1. Figure 18.5: Atrial Flutter with 2:1 Atrioventricular (AV) Block. (A) A 12-lead electrocardiogram showing atrial flutter with 2:1 AV block. There are two flutter waves for every ventricular complex. The two flutter waves are identified by the arrows and are labeled 1 and 2. The first flutter wave in lead II (arrow 1) may be mistaken for S wave and the arrhythmia may be misdiagnosed as SVT. (B) Lead II rhythm strip from (A), which is magnified to show the flutter waves (arrows). Figure 18.6: Atrial Flutter with 2:1 Atrioventricular Block. The first flutter wave (arrow 1) deforms the terminal portion of the QRS complex and may be mistaken for an S wave. The second flutter wave (arrow 2) is more obvious and precedes the QRS complex but can be mistaken for an inverted P wave. Thus, the arrhythmia can be mistaken for supraventricular tachycardia. Figure 18.7: Atrial Flutter with 2:1 Atrioventricular Block. The first flutter wave (arrow 1) may be mistaken for a depressed ST segment or inverted T wave. Figure 18.8: Atrial Flutter with 2:1 Atrioventricular (AV) Block. 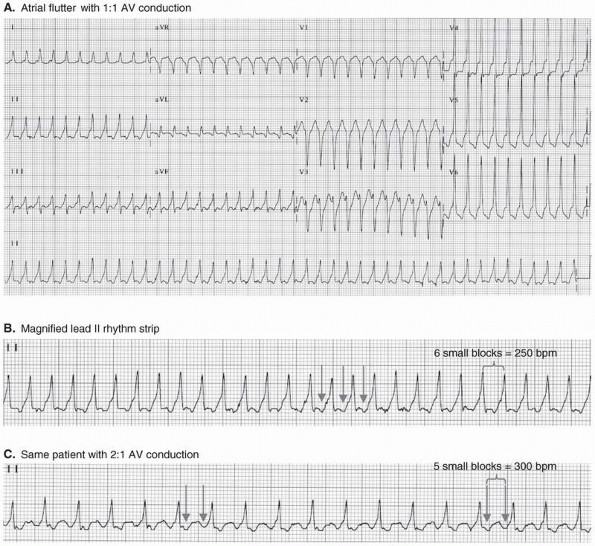 The diagnosis of atrial flutter with 2:1 AV block is not possible in rhythm strip (A). The first flutter wave (arrow 1) is buried within the QRS complex and the second flutter wave (arrow 2) can be mistaken for an inverted T wave. 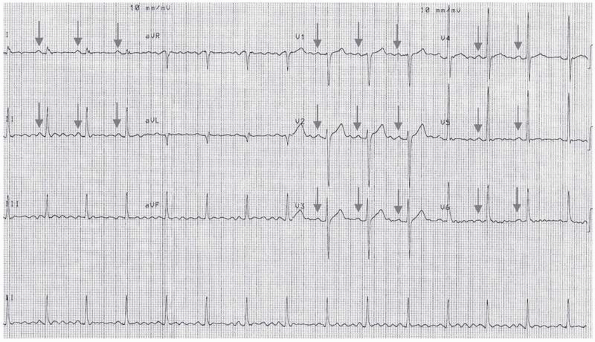 The diagnosis became evident only after sudden spontaneous slowing of the ventricular rate(B) (arrows), revealing the classical saw tooth flutter waves between the QRS complexes. Figure 18.9: Atrial Flutter. When the diagnosis is in doubt, carotid sinus stimulation may slow down the ventricular rate so that the flutter waves (arrows) can be identified. Atrial flutter will not convert to normal sinus rhythm with carotid sinus pressure or with atrioventricular nodal blockers. Figure 18.10: Atrial Flutter Resembling Atrioventricular Nodal Reentrant Tachycardia. Leads I, II, and III are simultaneously recorded. A narrow complex tachycardia with a rate of 125 beats per minute is seen on the left half of the tracing. The tachycardia was thought to be due to AV nodal reentrant tachycardia because no obvious P waves were noted. Adenosine was given intravenously, resulting in AV block. Upright flutter waves are now obvious in leads II and III with a rate of 250 beats per minute (six small blocks). The tachycardia is due to atrial flutter with 2:1 AV block. AV, atrioventricular. Figure 18.11: Atrial Tachycardia with 2:1 Atrioventricular Block. The atrial rate is typically 200 ± 50 beats per minute and the P waves are upright and separated by an isoelectric or flat line in lead II. Figure 18.12: Atrial Flutter with 2:1 Atrioventricular Block. In atrial flutter, the atrial rate is 300 ± 50 beats per minute. The flutter waves are typically inverted in lead II (arrows) and are separated by a continuously wavy baseline. Figure 18.13: Atrial Tachycardia with 2:1 Atrioventricular (AV) Block. Lead II rhythm strip showing atrial tachycardia with 2:1 AV block with an atrial rate of 230 beats per minute (6.5 small blocks). In atrial tachycardia, the atrial rate is typically 150-250 beats per minute. Note also that the P waves are upright in lead II with an isoelectric baseline. Atrial tachycardia with 2:1 AV block is usually due to digitalis toxicity and the ST segment depression shown above is characteristic of digitalis effect. Figure 18.14: Atrial Flutter (AF) Before and After Administration of Antiarrhythmic Agent. 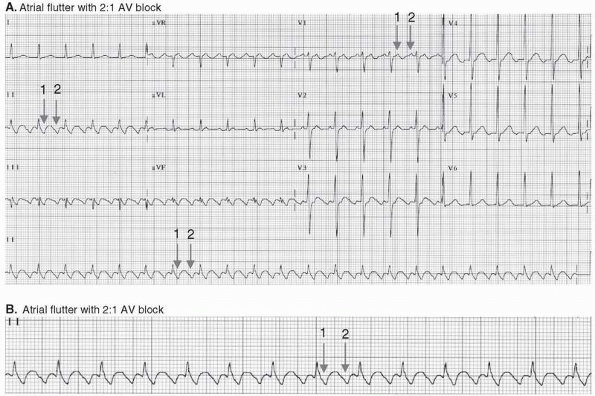 Lead II rhythm strips from the same patient before (A) and after (B) giving sotalol orally. The atrial rate in AF can become slower than 240 to 250 beats per minute if an antiarrhythmic agent is given that can slow the atrial rate. (A) The atrial rate was 250 beats per minute before receiving sotalol. (B) The atrial rate had decreased to 188 beats per minute after therapy. The flutter waves retain their typically inverted pattern in lead II, an important feature in differentiating atrial tachycardia from atrial flutter with 2:1 atrioventricular block. Figure 18.15: Atrial Flutter with 3:1 Atrioventricular Block. Rhythm strip showing three flutter waves (arrows) for each QRS complex. The first flutter wave (first arrow) is buried within the QRS complex. Figure 18.16: Atrial Flutter with 4:1 Atrioventricular Block. There are four flutter waves (arrows) for each QRS complex. Figure 18.17: Atrial Flutter with Variable Atrioventricular (AV) Block. The R-R intervals are irregular because conduction of the atrial impulse across the AV node is variable. Figure 18.18: Atrial Flutter and Complete Atrioventricular (AV) Block. Lead II rhythm strip showing atrial flutter with complete AV block. The R-R intervals are regular with a ventricular rate of 33 beats per minute. The atrial rate is 300 beats per minute. Figure 18.19: Motion Artifacts Resembling Atrial Flutter. (A, B) From the same patient. (A) Suspicious atrial flutter although distinct P waves are recognizable before each QRS complex in long lead V5 (arrows). The repeat electrocardiogram after the electrodes were stabilized (B) distinctly shows that the rhythm is normal sinus and not atrial flutter. · The ventricular rate is variable depending on the number of atrial impulses conducted through the AV node. · The QRS complexes are narrow unless preexistent bundle branch block is present; the atrial impulses are conducted with aberration or are conducted through a bypass tract. · ▪ Atrial flutter is a reentrant arrhythmia within the atria. It is usually precipitated by premature atrial complexes or repetitive impulses originating from other areas contiguous to the atria such as the pulmonary veins. Figure 18.20: “Atrial Flutter” due to Motion Artifacts. Another example of “atrial flutter” due to motion artifacts is shown. P waves can still be identified preceding each QRS complex (arrows). o ▪ Typical atrial flutter: The typical form of atrial flutter, which is the most common presentation, has a reentrant pathway located within the right atrium. The impulse travels down the lateral wall and up the atrial septum in a counterclockwise direction, resulting in negative or inverted flutter waves in leads II, III, and aVF and upright flutter waves in V1. The reentrant circuit involves an area of slow conduction between the tricuspid orifice and mouth of the inferior vena cava called the cavotricuspid isthmus. This is the usual site of radiofrequency ablation. 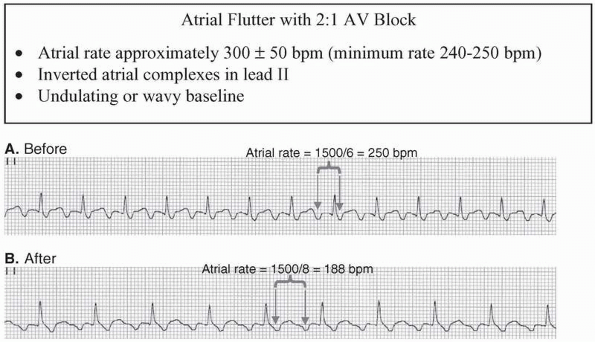 Figure 18.21: Artifacts Resembling Atrial Flutter. The patient was referred with a diagnosis of atrial flutter based on the electrocardiogram obtained from a doctor's office. The tracing shows that there are definite sinus P waves preceding the QRS complexes especially in leads I, II, and also in V1 to V6 (arrows). 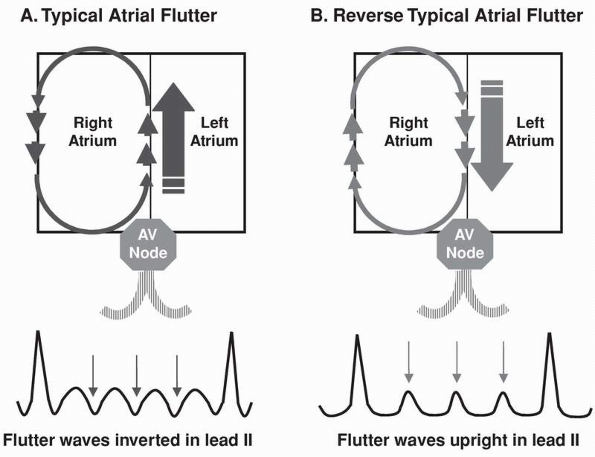 The rhythm therefore is not atrial flutter but normal sinus and the flutter-like undulations seen in leads II, III, and aVF are due to artifacts. Normal sinus rhythm was verified when the patient arrived for the consultation. o ▪ Reverse typical atrial flutter: The other form of atrial flutter, which is less common, has the same reentrant circuit but is reversed in direction. The atrial impulse travels down the atrial septum and up the lateral wall in a clockwise direction, resulting in flutter waves that are upright in leads II, III, and aVF and inverted in V1. · ▪ The reentrant circuit in atrial flutter can also occur in other locations other than the right atrium and includes the left atrium, in the area of the pulmonary veins, or around a scar or surgical lesion within the atria. Atrial flutter within the left atrium is more difficult to map because of its left atrial location. Figure 18.22: “Atrial Flutter” Caused by Infusion Pump. (A, B) From the same patient. The rhythm strip in (A) shows artifacts caused by infusion of intravenous fluids using an IVAC volumetric infusion pump. The artifacts can be mistaken for atrial flutter. The lead II rhythm strip in (B) was taken after the IV infusion pump was discontinued. IV, intravenous. · ▪ The incidence of atrial flutter is variable. It is more common in men than in women. Although atrial flutter may occasionally become persistent lasting for days or months, it seldom occurs as a chronic rhythm, very often converting to normal sinus rhythm or deteriorating to atrial fibrillation. Atrial flutter and atrial fibrillation are frequently associated arrhythmias. · ▪ Atrial flutter is usually associated with organic or structural cardiac disease or it may be precipitated by an acute condition. o ▪ An acute precipitating cause, usually surgery (cardiac or noncardiac), pneumonia, acute myocardial infarction, or congestive heart failure can be identified in 60% of cases. o ▪ The remaining cases are associated with chronic cardiac or pulmonary diseases or hypertension. o ▪ Atrial flutter not accompanied by structural cardiac disease or any precipitating condition is called lone atrial flutter. Lone atrial flutter is rare occurring only in 1.7% of all cases. · ▪ Atrial flutter with a rapid ventricular rate of 150 bpm with 2:1 AV conduction is the most frequent presentation in the acute setting. Less frequently, it may occur at a slower rate with a conduction ratio of 4:1. Atrial flutter with an odd conduction ratio of 1:1, 3:1, or 5:1 are much less common. · ▪ The rapid ventricular rate associated with atrial flutter may occur in patients with accessory pathways. It can also occur when there is increased adrenergic activity or when there is thyrotoxicosis. In patients with atrial fibrillation or atrial flutter who are being converted to normal sinus with Class IA (quinidine, procainamide, and disopyramide) and Class IC (propafenone or flecainide) agents, atrial flutter with 1:1 AV conduction can occur. Atrial flutter with fast ventricular rate may cause hemodynamic collapse and symptoms of low cardiac output, resulting in dizziness or frank syncope especially when there is left ventricular dysfunction or obstructive valvular disease. · ▪ Because atrial flutter follows a fixed pathway within the atria, the atrial rate is regular and is one of the most regular among all supraventricular tachyarrhythmias. 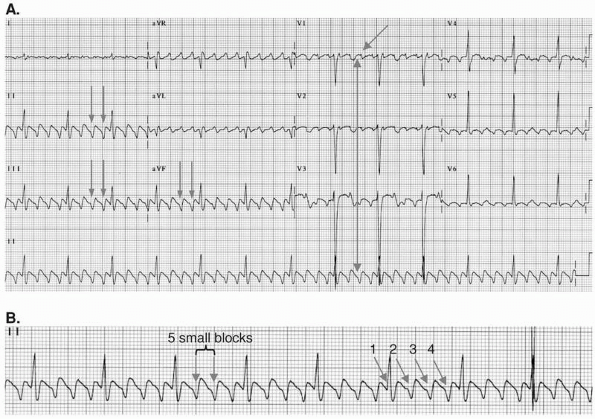 Atrial flutter with 2:1 AV block may be confused with SVT, especially when one flutter wave is buried within the QRS complex and the other flutter wave is inscribed midway between two QRS complexes. The flutter waves can be identified by slowing the ventricular rate with vagal maneuvers or, if unsuccessful, with AV nodal blocking agents. Adenosine, however, should not be injected when the tachycardia has wide QRS complexes because hypotension or ventricular fibrillation may occur if the tachycardia turns out to be ventricular. · ▪ Atrial flutter with 2:1 AV block should be differentiated from atrial tachycardia with 2:1 AV block. Atrial tachycardia with 2:1 AV block is commonly associated with digitalis toxicity, whereas atrial flutter with 2:1 block may require more digitalis to slow the ventricular rate. o ▪ Atrial rate: In atrial flutter, the minimum atrial rate is 240 to 250 bpm. In atrial tachycardia with 2:1 AV block, the atrial rate is usually 200 ± 50 bpm. o ▪ Morphology of the P waves: In atrial flutter, the flutter waves are inverted in II, III, and aVF and the baseline between the flutter waves is usually wavy and undulating. In atrial tachycardia with 2:1 AV block, the P waves are upright in II, III, and aVF and the baseline between the P waves is usually isoelectric or flat. · ▪ Similar to atrial fibrillation, atrial flutter can cause systemic thromboembolism and the incidence of stroke approaches that of atrial fibrillation. · ▪ Because atrial flutter is associated with mechanical atrial contraction, the physical findings of atrial flutter often show jugular neck vein pulsations coincident with each flutter wave in the ECG. Thus, the number of atrial pulsations (A waves) will be faster than the ventricular rate because atrial flutter is usually associated with AV block. When there is variable AV block, an irregular heart rate will be present, which can be mistaken for atrial fibrillation. The intensity of the first heart sound is constant when the AV block is fixed but is variable when there is varying AV conduction. · ▪ Anticoagulation to prevent thromboembolism: Anticoagulation should always be considered in all patients if the duration of atrial flutter is ≥48 hours or the duration is not definitely known. Atrial flutter, similar to atrial fibrillation, is associated with increased incidence of thromboembolism. This is further discussed in Chapter 19, Atrial Fibrillation. · ▪ Control of ventricular rate: Control of ventricular rate in atrial flutter is frequently more difficult than control of ventricular rate in atrial fibrillation. The pharmacologic agents that are commonly used include AV nodal blocking agents such as calcium channel blockers (verapamil or diltiazem), beta blockers, digitalis, and amiodarone. The agent of choice depends on the clinical status of the patient. The following are the recommendations for control of ventricular rate in patients with atrial flutter according to the 2003 American College of Cardiology/American Heart Association Task Force on Practice Guidelines, and the European Society of Cardiology practice guidelines for supraventricular arrhythmias. o ▪ Poorly tolerated: If the arrhythmia is poorly tolerated, direct current cardioversion to convert atrial flutter to normal sinus rhythm is a Class I recommendation. The use of nondihydropyridine calcium channel blockers (verapamil, diltiazem) or beta blockers (metoprolol, propranolol, or esmolol) are the most useful and effective agents in controlling ventricular rate in atrial flutter and receive a Class IIa recommendation. The beta blockers and calcium channel blockers have the same efficacy in slowing the ventricular rate. These agents are more effective than digitalis or amiodarone. Calcium blockers and beta blockers should not be used when there is acute decompensated heart failure or when the patient is hypotensive. Intravenous digoxin or amiodarone are the preferred agents and receive a Class IIb recommendation. o ▪ Stable patients: Conversion of atrial flutter to normal sinus rhythm with direct current cardioversion or with the use of atrial or transesophageal pacing both receive Class I recommendation even among stable patients. Calcium channel blockers and beta blockers are the most effective agents and receive Class I recommendation for control of ventricular rate in atrial flutter. Digitalis and amiodarone are less effective and receive a Class IIb recommendation. · ▪ Antiarrhythmic agents: The use of antiarrhythmic agents in converting atrial flutter to normal sinus rhythm is reserved for stable patients. The following antiarrhythmic agents are effective in converting atrial flutter to normal sinus rhythm: Class IA antiarrhythmic agents (procainamide), Class IC (flecainide and propafenone), and Class III agents (amiodarone, ibutilide and sotalol). Among the antiarrhythmic agents mentioned, the only intravenous agents available in the United States are ibutilide, amiodarone, and procainamide. o ▪ Ibutilide: Ibutilide, a Class III antiarrhythmic agent, is the most effective in acutely converting atrial flutter to normal sinus rhythm. This agent receives a Class IIa recommendation in converting stable patients with atrial flutter to normal sinus rhythm. Up to 78% of atrial flutter will convert to normal sinus rhythm within 90 minutes of infusion. The drug is less effective in converting atrial fibrillation to normal sinus rhythm. For patients weighing >60 kg, an initial 1 mg dose is injected intravenously for 10 minutes. The same dose may be repeated after 10 minutes if the initial 1 mg bolus is not effective. Torsades de pointes can occur in 2% to 4% of cases. The drug should not be given if the QTc is prolonged, there is sick sinus syndrome, or left ventricular dysfunction. o ▪ Procainamide: Procainamide, a Class IA antiarrhythmic agent, is given intravenously with a loading dose of 10 to 14 mg/kg for 30 minutes. This is followed by a maintenance infusion of 1 to 4 mg/minute. Procainamide should be combined with AV nodal blocking agents because 1:1 AV conduction can occur during infusion. 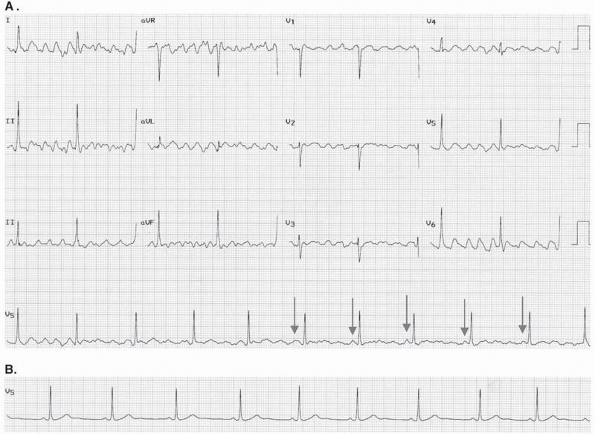 This agent receives a Class IIb recommendation for converting stable patients with atrial flutter to normal sinus rhythm. o ▪ Amiodarone: Amiodarone, a Class III antiarrhythmic agent, is effective in converting atrial flutter to normal sinus rhythm. It is also effective in controlling the ventricular rate of atrial flutter. The agent is not as effective as ibutilide, but is the least proarrhythmic and the drug of choice when left ventricular dysfunction is present. The dose of amiodarone for terminating atrial flutter is 5 mg/kg given intravenously in 10 minutes. This drug receives a Class IIb recommendation for both rate control and for conversion of atrial flutter to normal sinus rhythm. o ▪ Other agents: Propafenone and flecainide (Class IC agents) and sotalol (Class III agent) are not available as intravenous agents in the United States. Dosing is discussed inChapter 19, Atrial Fibrillation. These agents receive a Class IIb recommendation for conversion of atrial flutter to normal sinus rhythm. Class IC agents should be combined with AV nodal blocking agents to prevent 1:1 AV conduction. o ▪ Type I. Atrial flutter is called type I if it can be converted to normal sinus rhythm with rapid atrial pacing. The atrial rate in type I atrial flutter is classically >240 bpm and includes both typical and reverse typical atrial flutter as well as atrial flutter associated with reentry around surgical lesions within the atria. o ▪ Type II. Atrial flutter is called type II when it can not be interrupted by rapid atrial pacing. The atrial rate is more rapid than type I atrial flutter and exceeds 340 beats per minute. · ▪ Electrical cardioversion. Atrial flutter is one of the most responsive arrhythmias that can be terminated successfully with very low energy settings. Approximately 25 to 50 joules or less may be enough to terminate atrial flutter especially if biphasic current is used. Fifty to 100 joules is usually needed during elective cardioversion and is effective in >95% of patients. Direct current cardioversion is the treatment of choice when rapid conversion to normal sinus rhythm is desired and receives a Class I recommendation for both stable and unstable patients. · ▪ Catheter ablation of the reentrant pathway: Long-term therapy of atrial flutter especially when recurrent includes ablation of the reentrant pathway with an endocardial catheter. In typical atrial flutter, the reentry is confined to the right atrium and part of the pathway involves an area between the tricuspid orifice and mouth of the inferior vena cava called the cavotricuspid isthmus. This is the area where the reentrant circuit is usually interrupted by radiofrequency ablation. · ▪ Antitachycardia devices: Permanent pacemakers are capable of delivering rapid atrial pacing and can be implanted in patients who are responsive to rapid atrial pacing. Devices capable of delivering shocks within the atrium are also capable of converting atrial flutter to normal sinus rhythm. These devices, however, are currently not available for clinical use. · ▪ Surgery: This is similar to radiofrequency ablation except that surgery is performed to ablate the reentrant circuit. This approach is feasible in patients who are also scheduled to undergo coronary bypass surgery or open heart surgery for valvular disease. · ▪ Unlike atrial fibrillation, atrial flutter does not continue indefinitely and usually lasts only for a few days or a few weeks, although atrial flutter have been documented to last for several years. Atrial flutter usually degenerates to atrial fibrillation. It can result in tachycardia-mediated cardiomyopathy if the ventricular rate is not controlled. It may also cause thromboembolic events similar to atrial fibrillation. · ▪ Atrial flutter is usually associated with cardiac or pulmonary disease or an acute precipitating event. Unlike lone atrial fibrillation where 10% to 30% of patients do not have associated cardiac or pulmonary disease, lone atrial flutter is rare. The prognosis of atrial flutter therefore depends on the underlying condition. Blomstrom-Lundqvist C, Scheinman MM, Aliot EM, et al. ACC/AHA/ESC guidelines for the management of patients with supraventricular arrhythmias—executive summary. A report of the American College of Cardiology/American Heart Association Task Force on Practice Guidelines, and the European Society of Cardiology Committee for Practice Guidelines (Writing Committee to Develop Guidelines for the Management of Patients with Supraventricular Arrhythmias). J Am Coll Cardiol. 2003;42:1493-1531. Fuster V, Ryden LE, Cannom DS, et al. ACC/AHA/ESC 2006 Guidelines for the management of patients with atrial fibrillation: A report of the American College of Cardiology/ American Heart Association Task Force on Practice Guidelines and the European Society of Cardiology Committee for Practice Guidelines (Writing Committee to Revise 2001 Guidelines for the Management of Patients with Atrial Fibrillation). J Am Coll Cardiol. 2006;48:e149-e246. Ghali WA, Wasil BI, Brant R, et al. Atrial flutter and the risk of thromboembolism: a systematic review and meta-analysis. Am J Med. 2005;118:101-107. Saoudi N, Cosio F, Waldo A, et al. A classification of atrial flutter and regular atrial tachycardia according to electrophysiological mechanisms and anatomical basis. A statement from a joint expert group from the working group of arrhythmias of the European Society of Cardiology and the North American Society of Pacing and Electrophysiology. Eur Heart J. 2001; 22:1162-1182. Waldo AL, Biblo LA. Atrioventricular nodal-independent supraventricular tachycardias. In: Topol E, ed. Textbook in Cardiovascular Medicine. 2nd ed. Philadelphia: Lippincott Williams & Wilkins; 2002:1429-1451. Wellens HJJ. Contemporary management of atrial flutter. Circulation. 2002:106:649-652.